A professor of Spanish and a professor of Gaelic met at a conference and began discussing the relative merits of their respective languages. ‘Tell me,’ said the Spanish professor, ‘do you have a Gaelic equivalent for the Spanish phrase manana, manana?’ The Hebridean professor thought for a while, then replied ‘No, I do not think that we have in Gaelic a word that conveys such a pressing sense of urgency’. An old joke perhaps, but one that hints at the slower pace of life you can expect to find in the Gaelic-speaking communities of the Outer Hebrides, a place where the morning papers arrive in the afternoon and almost everything – in Lewis and Harris at least – closes down on Sundays. The Outer Hebrides – also known as the Western Isles, or Na h-Eileanan an Iar in Gaelic – are a 130 mile long string of islands lying off the northwest coast of Scotland. 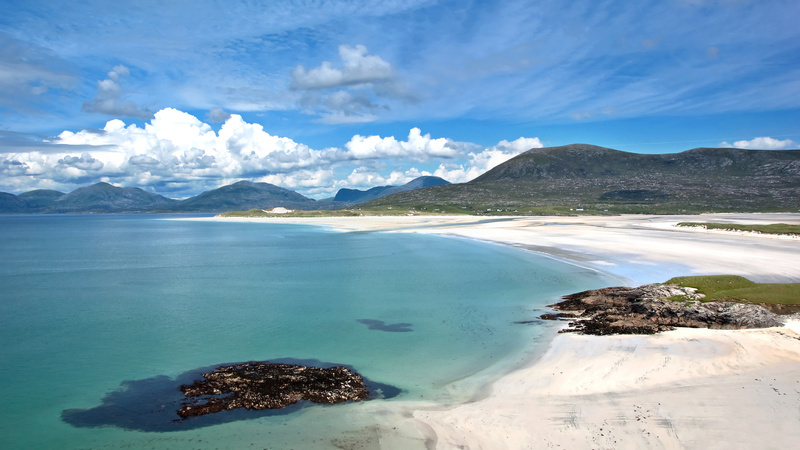 There are 119 islands in total, of which the five main inhabited islands are: Lewis and Harris (two parts of a single island, although often described as if they are separate islands), North Uist, Benbecula, South Uist and Barra. The middle three (often referred to simply as ‘the Uists’) are connected by road-bearing causeways. The ferry crossing from Ullapool or Uig to the Western Isles marks an important cultural divide – more than a third of Scotland’s registered crofts are in the Outer Hebrides, and no less than 60% of the population are Gaelic speakers. The rigours of life in the old island blackhouses (low walled stone cottages with turf roofs and earthen floors) are still within living memory. The name Hebrides is not Gaelic, and is probably a corruption of Ebudae, the Roman name for the islands. But the alternative derivation from the Norse havbredey – ‘isles at the edge of the sea’ – has a much more poetic ring, alluding to the broad vistas of sky and sea that characterise the islands’ often bleak and treeless landscapes. But there is beauty here too, in the machair (grassy, wildflower-speckled dunes) and dazzling white-sand beaches, majesty in the rugged hills and sprawling lochs, and mystery in the islands’ fascinating past. It’s a past signalled by Neolithic standing stones, Viking place names, deserted crofts and folk memories of the Clearances. If your time is limited, head straight for the west coast of Lewis with its prehistoric sites, preserved blackhouses and beautiful beaches. Contact us now to visit this must see attraction on your tours of Scotland.